Discussion in 'Off-Topic Discussion' started by FrankieButNotEdgar, Feb 4, 2019. As Belichick would say, it's on to 2019. Brian Flores officially took over as the new Dolphins HC and Zac Taylor took over as the Bengals head coach. I heard Rex Ryan was supposed to talk with the Chiefs about their DC spot but they hired someone else. I'm not sure if it was because of Ryan or the Chiefs that that didn't work out. I would like to see Ryan back in the league. Pats with 12 picks in the draft! Boom! The NFL's tradition of having the defending Super Bowl champion host a Thursday night home game to open the following season could be taking a one-year hiatus in 2019. According to the New Orleans Times-Picayune and long-time NFL reporter Ed Werder, the Patriots are likely going to be getting the boot from the 2019 opener in favor of two completely different teams. This isn't any conspiracy against the Patriots; the NFL is just thinking about doing something different because the league will be kicking off its 100th season in 2019. To celebrate the occasion, the NFL is apparently thinking about having two of its oldest teams -- the Bears and the Packers -- open the 2019 season with a Thursday night game in either Green Bay or Chicago. The Packers just celebrated their 100th season in 2018 and the Bears will be celebrating their 100th year in 2019, so the pairing would definitely make sense. Bears go 13-6, sweep the division, and win the super bowl. Amlap, Dimson, Poindexter and 1 other person like this. The Raiders are in talks to play their home games in San Francsico, where the Giants baseball team play their games. Amlap and FrankieButNotEdgar like this. For that team... I feel like that’s a far better city. The draft needs to hurry up and get here already. Y’all are gonna end up with Foles and I’ll be happy about that. Maybe, but I think we go with Bortles and a rookie. Makes more sense financially. Damn. First post of the 2019 thread and you went straight into Schefter mode. He is no Adarn Schefter. chrisc, Miz, kc56 and 2 others like this. 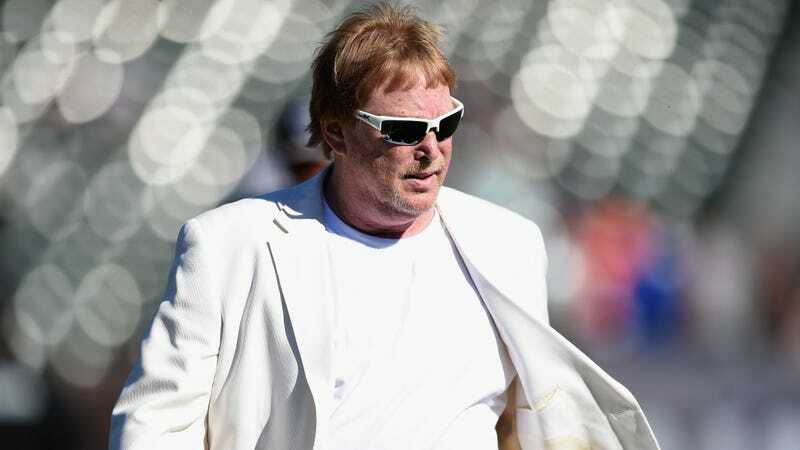 The saga of Mark Davis looking for a temporary home for his relocating Raiders took another stupid turn this week, after the team reportedly arrived at a plan to play their home games in nearby San Francisco. Turns out that plan, like so many of this idiot organization’s endeavors, was a big dumb non-starter. Scratch San Francisco off the list. Roger Goodell also recently shut down the idea of the Raiders temporarily relocating to San Diego. Apparently there still exists a possibility of the Raiders returning to the Coliseum next season, but at this point there’s a non-zero chance that the team winds up playing their 2019 home schedule in a different Walmart parking lot each week. Which honestly feels just right. Of all the narratives (a word I fully intend to expunge from the language as soon as I am named Secretary of Taste in the Harris administration) that the National Football League has had to combat in the last five years, there has been none quite so surreptitiously corrosive as the story of The NIMBY Raiders. That, children and other reprobates, is an old acronym meaning “not in my backyard,” and is usually applied to prisons, nuclear plants and reality television shows that want to set up shop in a community that will go to any length to prevent their arrival. As it applies to the Raiders, well, put it this way: There has never been a sports franchise that has ever created such “Don’t even park the car; just keep driving” unanimity. Nobody wants this team in 2019 except for rent money, and in a business built entirely on the inherent desirability of having a franchise, to have one that is less desirable than leprosy must be quite the helmet-to-helmet shot for Roger Goodell and his 32 overlords. But let’s review: Las Vegas wants them, but not yet. Los Angeles might have wanted them once upon a time but now has more teams than it can stomach. Oakland wouldn’t mind keeping them one more year but is willing to forgo that as part of their nine-figure courtroom gamble that started this whole dysentery camp–level mess. San Diego was mentioned briefly, but neither of the two Los Angeles teams nor the league want them in the vicinity, and it isn’t really known how much the customer base wanted them either. The San Francisco Giants want them for the rent, but the rest of the city (starting with Mayor London Breed) responded to the idea with horror, even though San Francisco had no problem at all welcoming (or jacking, if you prefer) the Warriors. Most interestingly, the Santa Clara 49ers are expected to prevent the Raiders from playing in San Francisco but would grudgingly consider letting them be tenants if only to get the rent that Mark Davis might otherwise spend in Oakland or San Francisco, and Santa Clara remains the least appealing choice for Davis. In sum, Davis has a thing of allegedly great value that nobody else wants to have anywhere near them. It’s as though he had just cornered the market on plague and is baffled that the market for death in the streets just isn’t there. It’s probably not fair to completely gut the little fellow here, but this being Deadspin, fair ain’t got nothin’ to do with it. Even before his dad took the big walk in 2011, Mark and the entire league operated on the assumption that the Raiders were a desirable and iconic entity in American sport and culture, and nearly a quarter-century of losing three out of every five games has not shifted him from that notion. It was natural, then, for him to assume that the Raiders would be welcomed anywhere, for any amount of time, under any conditions. It must be a shock to his sensibilities to learn that instead, they are at best a very resistible luxury and at worst a civic nuisance. This all began when the team started stumping for a new stadium to replace the Dilapidate-o-dome and learned that neither the City of Oakland nor Alameda County had the cash or the will to build them one, a wise choice given the way cities routinely get worked in such deals. In fact, given the choice between making nice with the A’s and their 81 dates and the Raiders and their 10 dates, Mayor Libby Schaaf chose Option A, and doubled down by refusing to entertain selling the Coliseum land for a football-only stadium, the rare show of an elected official not wanting any part of the NFL and its long history of shaking the change out of your pocket by hiring a crane operator to hoist you by your ankles. The damage to her reputation was so complete that she easily won re-election and her approval rating rose. Thus, the half-hearted flirtations with San Antonio which were exposed as the bad bluff they were. Then, the deal Davis struck with Dean Spanos and the San Diego Chargers to move as a tandem to Los Angeles only to find out that their fellow owners decided to bait-and-switch them in favor of Stan Kroenke and the Rams, and then cut a side deal with Spanos for an option to move the Chargers that to their horror he accepted. The backup plan as of 2016 seemed to be to let the Raiders rot in Oakland until Davis ran out of money, will, or both, but instead he fooled everyone by cobbling the Las Vegas deal together (with much help from connected Nevada power brokers, if that isn’t a redundancy). The only hitch he still had to negotiate was 2019, the year after the expiration of the lease in Oakland and the expected completion of the Vegas stadium. That became the issue we have before us when the city decided to sue Davis, the Raiders, and the league for multiple forms of weaselry in much the same way that St. Louis is suing Kroenke, the Rams, and the league for being similarly abandoned. Properly besnitted, Davis announced he would not play in Oakland again—of course, he announced this without having an alternate site already picked and approved. And now, all his choices are bad—again, and all because he forgot the first rule of shelter management. Get the place you’re going to before you leave the place you’ve been. Unlike most college students worth the tuition, he can’t move back to Mom and Dad’s. Most folks are guessing he will crawl back to Oakland, shamed and embittered, but two days ago San Francisco was the sure thing and a day ago it was Santa Clara. By Friday, it could be Fresno State. All said, who realized that the idea of the NFL as an extravagance any city would be proud to be exploited by had finally reached the event horizon? Vegas isn’t ready for the Raiders, Oakland can take them or leave them, San Francisco can’t have them and Santa Clara will only take them for a quick buck, and can live without them. Barring a Washington Generals–style solution in which they become the first all-road NFL team since the 1920s, the Raiders have become the thing the NFL overlords never conceived. The team everyone has agreed to be someone else’s problem. 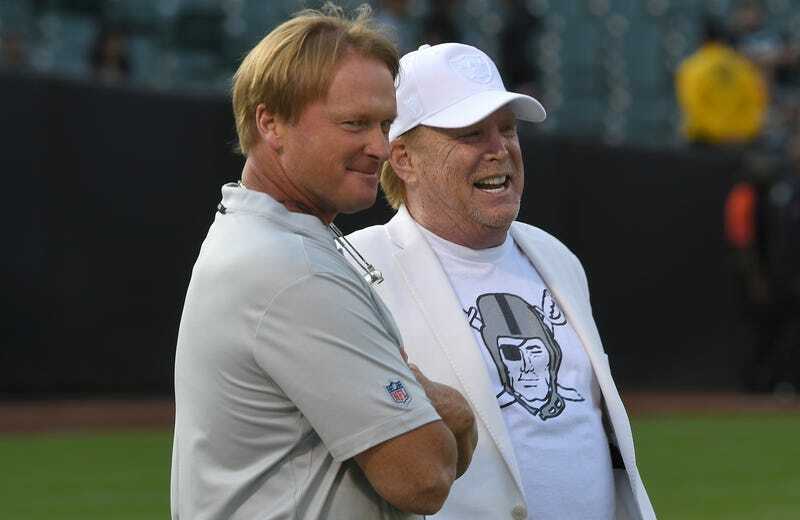 I think they try to cobble together a deal to become the Mexico City Raiders before going back to Oakland hat in hand. The 49ers not allowing the Raiders to play in San Francisco is because they want the Raiders to play their games at Levi stadium so that they get that rent revenue. Blocking them from the San Fran area is a business decision. jesusatemyhotdog and Dimson like this.